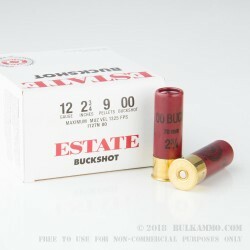 Hunters will appreciate the low cost, high power, and effectiveness of this 12 gauge buckshot load from Estate. 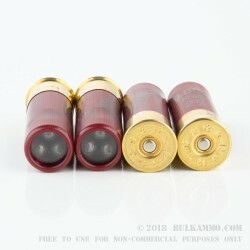 Each 2-3/4" shell in this bulk priced case of 250 fires 9 pellets of 00 buck at a muzzle velocity of 1,325 feet per second, putting this ammunition in the "express" category. 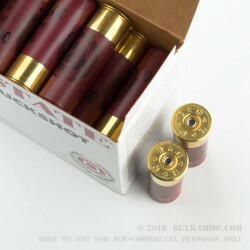 This ammo will produce good patterning, though at the cost of substantial recoil. A great choice for close encounters with deer and other thin skinned game! 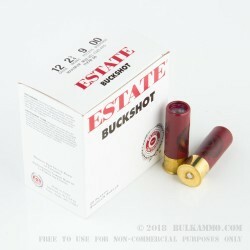 Estate ammunition is loaded in the USA by Federal. Both brands are part of Vista Outdoor, which also owns Speer, Bushnell, Millett, and other well known lines of shooting products.